Geothermal Heat Pumps – E&B Heating & Air, Inc.
Geothermal heat pumps can save you amazing amount of money and we are your geothermal experts in Tallahassee and the surrounding areas. Take look below at most popular geothermal products. 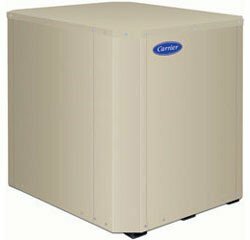 Carrier's GT-PE Split geothermal heat pump provides a great option for replacement installations. 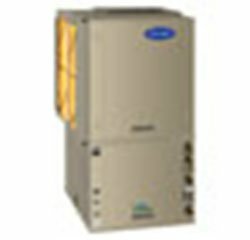 Simply locate the unit outdoors in place of the air conditioner and connect it to the indoor furnace or air handler for a quick, no-frills upgrade to an existing system. It features a two-stage scroll compressor and Puron® refrigerant. In sizes from 2 through 5 tons. Carrier's GT-PG series offers exceptional quality and high performance. A single-stage scroll compressor, combined with Puron® refrigerant, optional variable-speed motor, E-coated coil, microprocessor control and quiet operation make this a great choice. Available in vertical top flow, vertical bottom flow and horizontal flow, all with optional hot-water generator. In sizes from 1½ through 6 tons. Carrier's versatile GT-PW series can be applied in a variety of heated water and chilled water applications. Single-stage scroll compressor, Puron® refrigerant. Optional potable hot-water generator. In sizes 3, 5, and 10 tons. 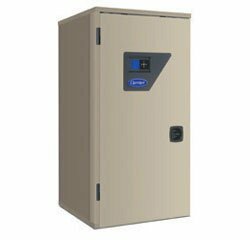 Carrier's GT-PW water-to-water model delivers hot-water temperatures of up to 145°F for demanding radiant or hydronic applications. Scroll compressor, Puron® refrigerant and onboard controls make this unit an exceptional performer. And it's about 5 times more efficient than a traditional boiler. Euro-style cabinet design for aesthetics and quiet operation. Available in a 3 ton size. 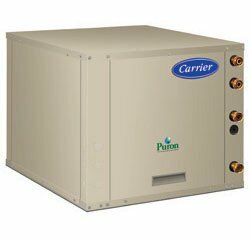 Carrier's popular GT-PX series is our highest rated geothermal unit, featuring Puron® refrigerant; a two-stage compressor for efficiency; variable speed blower for comfort; E-coated coil; microprocessor control; and a robust, insulated cabinet for quiet operation. Available in vertical top flow, vertical bottom flow and horizontal flow, all with optional hot-water generator. In sizes from 2 through 6 tons. 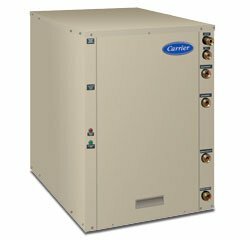 Carrier's GT-PX Split offers high-efficiency performance and is designed to be coupled with a high-efficiency natural gas/propane furnace or air handler. It features a two-stage scroll compressor, Puron® refrigerant, and quiet operation. Plus optional hot-water generator. In sizes from 2 through 5 tons.